Hi there! My name is April Brover and I am so pleased to see you here. I am a pastor/teacher’s wife and a mama of three. Happy Hymnody was born out of a need to get gospel truths into the hearts of those kiddos and for a solid bed-time routine! It was something we began when my oldest was about two years old, and my husband and I longed to finish the day with our children in praise and prayer. We began singing and memorizing one hymn a month. Our bedtime routine started catching on with our friends and before we knew it, #hymnofthemonth became a fun hashtag on Instagram. Happy Hymnody is currently a growing community of families who are committed to raising up the next generation to savor & serve Christ, the Rescuer of our souls. We do this through sowing the seed of the Gospel into their hearts through family worship, teaching sound doctrine and theology, memorizing theologically solid hymns, psalms and spiritual songs, and creating rich Christ-centered traditions that point to our Sovereign King. I invite you to join us in the #hymnofthemonth movement. On the first of every month, we post a new hymn that we learn together as a community. We provide links to YouTube for fresh versions that honor the original tune and lyrics and we provide free printables that get the words in front of you. 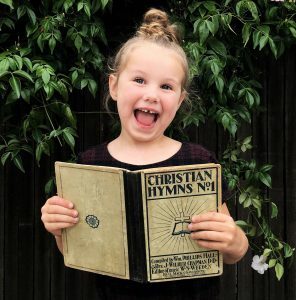 On our Instagram page we’ll explore the truths behind the hymn, the life of the writer and what hymn time and other traditions look like for families within the Happy Hymnody community. Together, let’s sow these truths into our children’s hearts and lift our voices in praise to the holy One.